one preliminary, interesting, discussion of the arrival of the japanese aesthetic to the west can be found here. 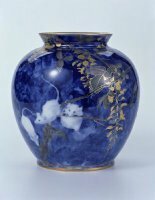 a wonderful introduction in the form of a review by the director of the center for the study of japonisme at rutgers, phillip cate, of a book on the formost progenitor of japonisme, of l'art nouveau (his shop in paris), s. bing. here.